Some mornings you may wake up with crusty particles or mucus in the corners of your eyes. Referred to as sleepy sands or eye boogers, this can be a normal circumstance that forms as we sleep. It may present as a tiny hard form or as a clear or colored liquid. Depending on the type and cause, it can indicate a mild or serious eye condition. We will look at why the mucus in eye happens and how to treat the various types. When we sleep, our eyes are unable to blink, reducing the production of tears used to protect the eye. These tears coagulate and become small dry balls of crust. As a defensive function of our eye, it can produce a discharge to fight a harmful invader. This mucus can be a sticky yellow crust that appears to seal your eyelids shut. It is usually temporary, but some conditions can be more of a serious nature. Known as pink eye, conjunctivitis is usually caused by three major forms. If you find your eyelid shut tight and have trouble opening it, you may be suffering from bacterial conjunctivitis. It produces a thick liquid of yellow or green mucus throughout the day, and is caused by a bacteria infection. Viral conjunctivitis presents as a thin and clear, or a very distinct yellow coloring. Both are very contagious as they can be spread by contact of an infected person. Allergic conjunctivitis appears as a stringy mucus, white in color. To fend off allergens such as pollen, we produce the antibody immunoglobulin, which stimulates the release of histamine. This can result in red or pink eyes. 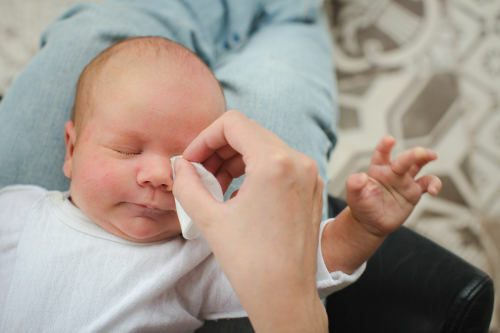 Our normal tear production is formed by water, mucus, oil, vitamins, minerals, and enzymes. Dry eye syndrome occurs when there is a lack of water in the tears. Thus, the mucus and oil form in eye corners while we sleep. An injury, infection, or even a tumor can cause our tear ducts to become blocked, preventing the proper drainage of tears. This results in mucus and excess tears to settle into the corners of our eyes. While it indicates a problem in adults, it is a normal condition during the first year of a newborn’s life. Caused by a bacterial infection, blepharitis affects the eyelid region with a crusty mucus discharge and redness. The Meibomian glands can become infected, giving the excess discharge. Hand-to-eye contact of those with skin conditions such as rosacea or psoriasis, or from improper hand washing, can cause this condition. Our eyelids may become infected with blepharitis, causing yellow thick discharge. This is seen with the common cold and flu. To effectively treat eye discharge, it is important to understand the underlying cause of the condition. The type of discharge is key, as it can vary in color, texture, frequency, accompanying symptoms, and if any other medical condition exists. The small, hard balls of mucus that are found in the corner of your eye are linked to an allergen. This can be a reaction to dust, pollen, mold, or dander. It is common to be accompanied by swollen eyelids, visible red blood vessels, tearing, and a possible itching or burning sensation. A production of thick and crusty mucus is caused by a variety of causes such as a bacterial or viral infection, an allergen, or environmental factors such as smoke, shampoos, or pool chlorine. This may be seen with redness, excessive tearing, itchiness, blurred vision, or light sensitivity. It can lead to blepharitis. A discharge of thick mucus with the coloring of a green or gray hue can be from a bacterial infection such as bacterial conjunctivitis. You may have symptoms of redness, irritation, itchiness, and excessive discharge. If you have a watery mucus discharge, you could have a staphylococcus bacterial infection. Look for a small red bump on the outside or indie of the eyelid, known as a sty. Watery discharge could also be caused by a viral infection with symptoms of inflammation, redness, pain, or blurred vision. A stringy eye discharge that is white can be caused by allergic infection or dacryocystitis, inflammation of the tear duct itself. An acute form of this infection shows signs of redness, pain, blurred vision from swelling, and excessive tearing. A chronic infection will also have excessive tearing and redness as well as swelling of the tear duct. Yellow eye mucus is present with blepharitis from a bacterial infection, an allergen, lice or eyelash mites, seborrheic dermatitis, medications, or obstructed oil glands. Other symptoms may include oily eyelids, redness, itching, light sensitivity, loss of eyelashes, crusty eyelashes, or flakes. If a sty is present, the eye can produce this yellow eye discharge. Dry eye syndrome can cause small white eye mucus or yellow balls of mucus to form in the corners of the eyes. Factors linked to this condition include exposure to pollutants such as smoke, wind, the sun, or medication reactions. You can also expect to have a burning sensation, blurred vision, redness, or itchiness symptoms. If the condition is caused by dacryocystitis, your symptoms may include swelling under the bottom eyelid and pain across the upper portion of the face. How to Get Rid of Eye Boogers? There are a few things you can do when you wake up with hard or liquid mucus discharge of the eyes. Here are some home eye discharge treatment options. Apply a warm, wet towel to the eyes for a few minutes before gently wiping away the mucus. This will also help with any itchiness due to the discharge. Use a gentle soap such as baby shampoo to remove any flakes, hard crusts, or oil from the outside edges of the eyes and eyelids. Remove any excess oil under the lids by gently massaging the top of the eyelid in a downward motion. If you notice any mucus during the day or evening, remove contact lenses and allow the eyes time to breath. Replace lenses before using again. Also, you should replace or thoroughly cleanse your contact lens storage case. Be sure not to use the same eyeliner, eyeshadow brush, or mascara wand after having an eye infection to avoid recurrence of the problem. While the infection is present, do not use any eye makeup. Triggers such as smoke, pet dander, mold, and dust should be avoided to prevent further eye infection. If you have pets, wash hands with a gentle soap after interaction before rubbing eyes. Frequent hand-washing can prevent the spread of infection, as well as contracting an eye infection. Do not share hand towels when you have an eye infection. Issues pertaining to the eyes can be a concern, as it is very easy to have an infection or disorder that can lead to forms of vision loss. Usually, the morning crusty or liquid discharge we may have, can be treated. The underlying cause of eye mucus can be determined by the accompanying symptoms, and the texture and color of the discharge itself. Use a few home remedies and common sense hygiene tips to prevent spreading the infection and any recurrence. Thompson, S., “Eye Discharge – Causes, Symptoms, and Relief,” EyeHealthWeb, October 2015; http://www.eyehealthweb.com/eye-discharge/, last accessed March 15, 2017. “Pink eye (conjunctivitis),” Mayo Clinic; http://www.mayoclinic.org/diseases-conditions/pink-eye/basics/definition/con-20022732, last accessed March 15, 2017. “Mucus in Eye,” EnkiVillage; http://www.enki-village.com/mucus-in-eye.html, last accessed March 15, 2017. Bedinghaus, T., “All About Eye Mucus,” Verywell, October 31, 2016; https://www.verywell.com/eye-mucus-types-3422108, last accessed March 15, 2017. Surtenich, A., “Eye Discharge (Sleep in Your Eye),” All About Vision; http://www.allaboutvision.com/conditions/eye-discharge.htm, last accessed March 15, 2017. Conrad Stoppler, M., “Eye Discharge,” MedicineNet; http://www.medicinenet.com/eye_discharge/symptoms.htm, last accessed March 15, 2017.